All our products meet all legal requirements and are in full compliance with EU Directive 2011/65/EU, Restriction of Hazardous Substances (RoHS) and for radio Equipment also comply with R&TTE directive 1999/5/EC. We put a lot of time and effort into selecting the best suppliers according to our high quality standards. TagMaster´s suppliers undergo regular assessments. Approved suppliers must have a quality management system that ensures best product quality over time, and should preferably be certified according to ISO9001 and ISO14001. TagMaster is an application driven technology company that designs and markets advanced identification and detection systems and solutions based on radio & vision technology (RFID & ANPR) for demanding environments. Business areas include Traffic Solutions and Rail Solutions providing innovative mobility solutions in order to increase efficiency, security, convenience and to decrease environmental impact within Smart Cities.Through market-driven development, we satisfy our customers with adaptable and sustainable solutions. Purposeful training will reinforce skills in prioritized areas. Our overall objective is that our products are developed, manufactured and delivered to internal and external customers´ full satisfaction. Continuous improvements will characterize the business where legal and other requirements represent the minimum level. TagMaster has a thoroughly documented Quality Management System (QMS) stating our company quality policy and providing guidelines for all activities within the organization. The QMS is implemented throughout the organization and is available to all personnel on the company network. TagMaster’s management group has the overall responsibility for quality impact, which means initiating efforts to establish, maintain, monitor and improve QMS. 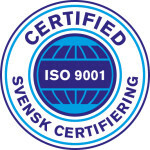 Our QMS is regularly audited by Svensk Certifiering AB. Our aim is to thoroughly assess the quality system´s design, scope and effectiveness. Overall quality objectives are zero defects and satisfied customers. Deadlines, delivery precision and customer satisfaction are evaluated, as well as how the results should be analysed and followed up. Quality objectives shall be known throughout the organization, and all employees should strive together to achive the requested objective levels.